A full-size image (284 KB) is also available. Orientation: NY 5 makes an arc across the bottom of this photo, while NY 695 runs from NY 5 toward top right. Gere Lock Road is the surface road at top, and Horan Road is that which parallels NY 695 at right. Exit numbers: Exits are not numbered on either NY 5 or NY 695. The interchange: The interchange between NY 5 and NY 695 is a perfect example of the directional-T configuration, without the three-level crossing sometimes found with this design. 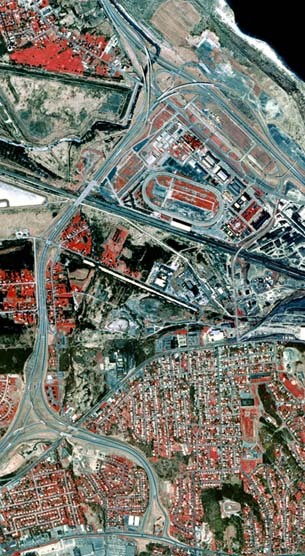 By modern standards, the preferred design for this type of junction is the semi-directional version, in which left-turn ramps branch from the right side of the main route and cross over the highway. For such a design, is becomes necessary to determine which highway is to be considered the through route and which the intersecting, and this distinction is often unclear. In the example above, all three approaches seems to be of similar importance, despite clues from the route numbering that the east-to-west route (NY 5) is the through route. Yet in actuality, the predominant traffic flow is from north to west, with motorists exiting Interstate 690 to NY 695 in order to reach points west on NY 5. Notice that there is a right-of-way cleared and graded in the photo above, which would enable the ramp from NY 695 to NY 5 east (the lesser-used reverse turn movement) to be converted into a semi-directional flyover. At the present time, however, the interchange remains configured as shown above. At the top of the photo is seen the only interchange exclusive to NY 695. It is a modified half-diamond, with a southbound-only exit to Gere Lock Road and a corresponding northbound entrance from Horan Road. 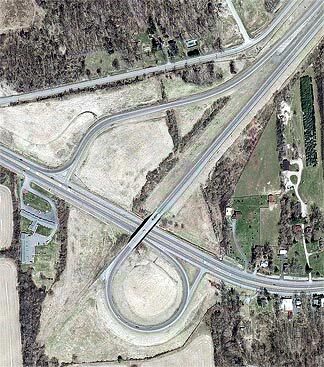 This interchange serves a primarily industrial area of the Town of Camillus and the adjacent Village of Solvay. To the north, NY 695 ends shortly afterward at an interchange with I-690 and State Fair Boulevard. NY 695 is among New York's shortest freeways ( see overview) at a mere 2.05 miles long. Through much of the Town of Camillus, NY 5 follows an expressway alignment, built to alleviate congestion on West Genesee Street, which formerly carried the designation. The east end of this expressway (right) is located in the Westvale neighborhood of the Town of Geddes. 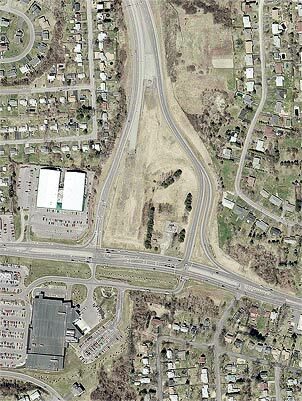 The expressway was planned to continue across West Genesee Street as a southwestern bypass of Syracuse, and would have connected with the junction of Interstates 81 and 481 in southern Syracuse. A spur from this beltway would have carried NY 5 into the downtown district. Today, the expressway stub shows a partially-built folded diamond interchange (with a loop in the northeast quadrant), where today NY 5 turns east onto West Genesee Street towards Solvay. The cleared right-of-way is largely intact along the highway's planned path through the Towns of Geddes and Onondaga, although new development can already be seen on the south side of Genesee Street. The western end of the NY 5 expressway (left) is just west of the Village of Camillus. NY 174 ends here, running eastward along Old NY 5 into Camillus, where it originally terminated. NY 5 turns from north to west at this point, by means of two ramps of a partial cloverleaf interchange. Pavement stubs remain today as a reminder of plans to extend the NY 5 expressway westward to Auburn, which are unlikely to be fulfilled in the forseeable future.